In this section of the site we’ve tried to answer the most commonly asked questions that people have about our products and services. If you cannot find the answer to your question here you can try using our search function or let us know and we will get back to you with an answer as quickly as we can. Syntec is an independent, privately owned UK-based company founded as Syntec Telecom in 1998. Syntec's services have now diversified into an integrated suite of contact center management services at network and hosted ('cloud') level, with clients across many sectors in the UK and internationally. No, Syntec is an independent Ofcom-regulated telecoms network operator. Syntec develops, maintains and supports its own telecoms network (PSTN and VoIP) and managed 'software as a service' (SaaS) solutions for call centers and contact centers. Does Syntec run its own outsourcer call centers? No, Syntec provides telecoms and other managed solutions for its clients' own call centers - including, in fact, to a number of major outsourcers in the UK and overseas. Does Syntec work outside the UK? Yes, Syntec has customers internationally for delivery back in the UK and also stand-alone CardEasy services. Which sectors does Syntec focus on? Syntec's clients are from a broad spectrum including public and private sector, businesses and charities, from small to multi-site and multi-national. Does your on-premise CardEasy solution work with any make/model of telephone system? Yes, our CardEasy hardware is completely agnostic to your existing telephony hardware and has already been deployed for customers using the likes of Cisco, Avaya, Mitel, Genesys and Intertel to name a few. CardEasy supports all of the functionality that is provided by your Payment Services Provider (PSP). CardEasy integrates with your Payment Services Provider (PSP) to provide you with all the information and functionality you usually enjoy from them e.g. fraud checks; tokenisation (to capture the card details first time round for repeat use); and multiple payments. What is the difference between a pause/resume function on call recording and a DTMF based PCI solution? A pause/resume function on your call recording (whether manual or automated) will only prevent sensitive payment card details from entering your call recording. 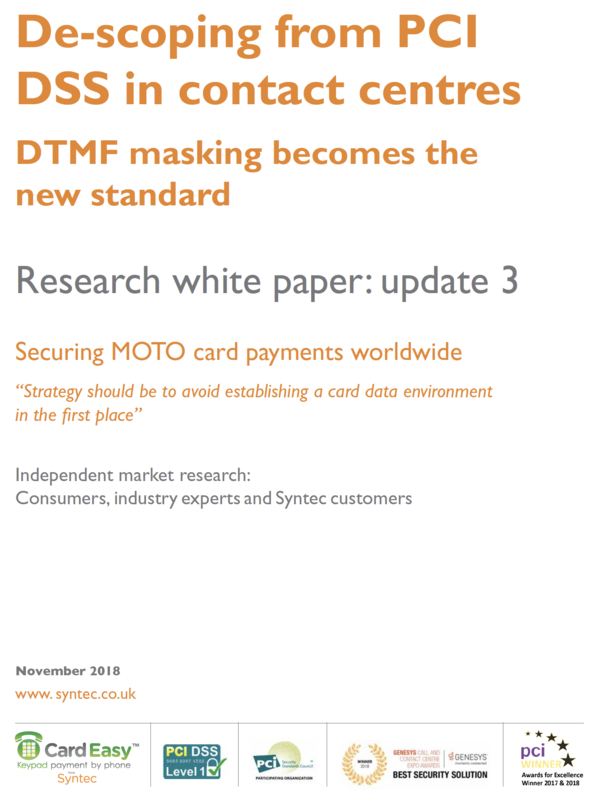 As your customers will continue to provide their payment card details verbally, your call center agents, systems and network will remain firmly in-scope. CardEasy will de-scope your call center agents, call recording (without the need for pause/resume), systems and network. Is the mid-call version of CardEasy IVR-based? The mid-call version of CardEasy involves a live conversation between a customer and a call center agent on either an inbound or outbound call. 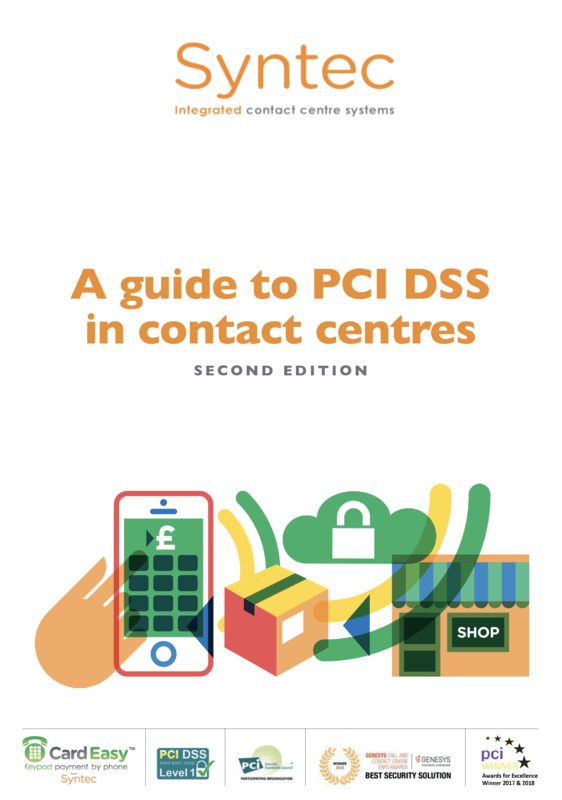 The mid-call card payment process involves the call center agent asking the customer to provide their card number (PAN) and card security code (CV2) using their telephone keypad, whilst remaining connected to the call center throughout. There is no IVR involved with the mid-call version of CardEasy. However, CardEasy is also available as a fully automated (IVR based) solution which we call AutoPay, which is ideal for balance payments, donations, subscription services etc where no agent intervention is required. Does CardEasy hand the caller off from the agent to an IVR? No, CardEasy works live in conversation with the agent, so the agent is in control of the call throughout including whilst the customer enters their card numbers using the keypad of their phone. CardEasy also has a customer self-service option which is IVR driven, but this is separate from the agent mid-call version. 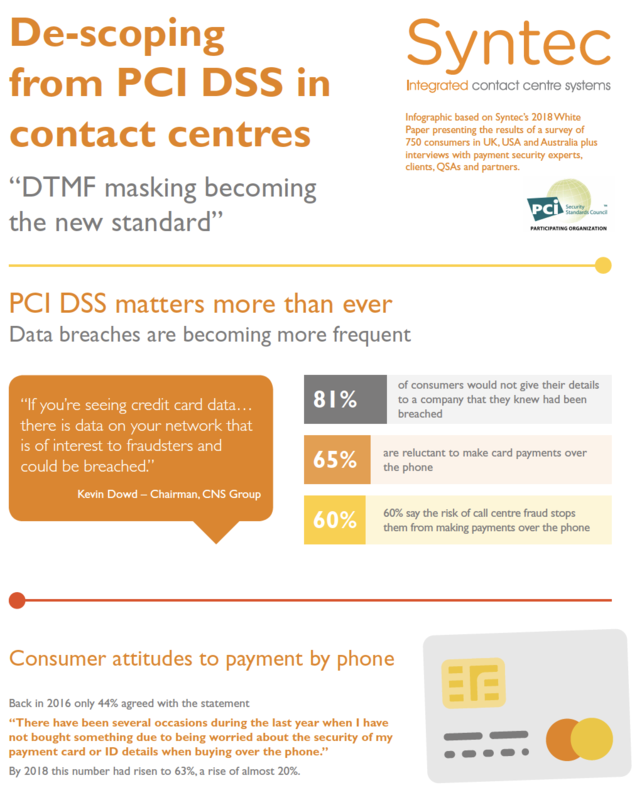 Is CardEasy PCI DSS compliant? Yes. 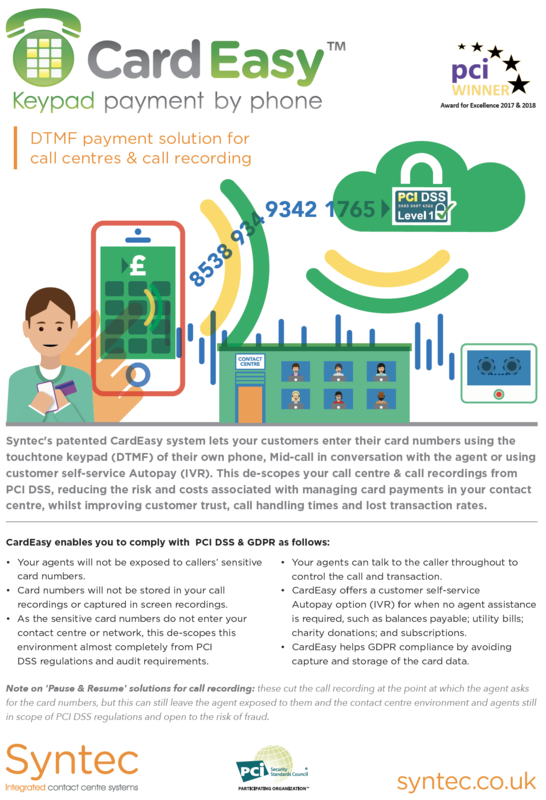 CardEasy is developed and supported by Syntec, a PCI DSS level-1 service provider (as listed in the Visa Merchant Agent portal) and a Mastercard Worldwide Services Provider. Will CardEasy work with my existing payment gateway? Yes. CardEasy is already integrated for Syntec clients with most of the major gateways and the CardEasy API is designed to be quick and simple to integrate with any others. See our list of partners for information about just some of the payment gateways with which we work. Does CardEasy require us to re-route our calls to the CardEasy service? No, calls do not need to be re-routed, nor does the agent need to hand the call off to an IVR / automated system. CardEasy works mid-call with your existing telephony. Does CardEasy work with all payment service providers, acquirers and tokenization service providers? Yes, CardEasy is fully integrated with a large number of leading PSPs, acquirers and tokenization service providers. CardEasy integration with a new provider is normally very simple and straightforward for us to achieve. Does CardEasy involve complex and time-consuming integration with clients' existing systems? No. CardEasy is designed to enable easy integration with your existing telephony and 'lite touch' integration with your CRM systems as well as involving little or no change to the customer experience. Will CardEasy work with our existing call recording solution? Yes, CardEasy works with any call recording system and means that you no longer need to 'pause and resume' the recordings (if applicable). Yes, CardEasy supports multi-currency transactions. Have you implemented solutions for any large companies? Yes. CardEasy has been implemented for many large companies including multi-nationals / multi-sites and with outsourcers / DR sites. What merchant level has CardEasy been designed for? Merchants of all sizes, including level one. In which industries is CardEasy in use? CardEasy is already in use internationally by organizations across many sectors including travel, utilities, banking, insurance, financial services, global retailers, manufacturers and charities. We are not restricted by geographic location, size of call center or industry. Do you perform a Mod 10 / Luhn validation prior to tokenisation? The CardEasy system performs a dynamic lookup of the bank identification number (BIN) after the first 6 digits of the PAN have been entered and informs the agent of card issuer and scheme. This is a fraud prevention measure and also allows automatic surcharging based on card type dependent on the method of integration. When the PAN capture is complete the system performs a Luhn check and informs the agent visually of the pass/fail status in real time. This helps identify mis-keying and digit transposition. Is CardEasy suitable for smaller merchants? Does CardEasy help with GDPR compliance? Yes, because card numbers no longer enter your contact center environment using CardEasy, this is one important element of Personal Data (PII) you no longer have to worry about. AgentCall is Syntec's suite of integrated web-based services to manage your call center or contact center. AgentCall essentially replaces legacy premise-based systems such as ACD equipment, wallboards and call recording hardware with services hosted 'in the cloud' (i.e. in Syntec's remote servers or Syntec's telecoms network) and multi-tenanted/ developed continuously for many Syntec clients. No. There is no need to install any software on PCs to access our user-friendly AgentCall system. It’s completely cloud-based and can be access from anywhere with a web connection enabling home-workers to log in as if they were in the office. Under the Manage Account Section you should see an option to choose Downloads. Here you will find links to all your past invoices going back since you started with us. It'll also have a link to download your Call Detail Records (CDRs) which gives you the opportunity to access all call history. The invoices can appear in a few ways. An invoice shows charges made to you, whilst a SB invoice (self billed) is one where we've paid you (generally speaking from revenue shared numbers). These would be accompanied by a statement that nets the two, and occasionally by a credit note where applicable. My agent has calls appearing in their sidebar or queue view so why isn't their phone ringing? It's possible the agent has entered their number in wrong so we're attempting to call a different number to the one that should be being called. If they enter their number when they log in it's probably quickest to log out and in again making sure they have the right number. If they don't enter a phone number - generally because it's locked in the AgentCall interface, you should log into that interface to make sure it's correctly inputted there. You can find it under Manage Account. If their phone number is correct it's worth making sure there isn't a problem with that number - the simplest way to do this is to call it from a mobile and make sure you're getting through. If it's working from there then let us know we will investigate further. How do after-call surveys work? If you'd like to encourage callers to give you feedback we can arrange a survey at the end of the call. You tell them about it in the introduction to the call and ask them to hang on if they'd like to review you after they've spoken to an agent. Then when the agent hangs up they're presented with some questions (e.g. rate us 1-5, was your issue resolved yes or no), given the opportunity to leave feedback and depending on the nature of the response might generate an alert to be sent to the call center manager with links to the original call and responses. Immediate responses to the questions you need to be answered. Very fast responses to serious problems. Opportunity to vent in a forum that you have control over before leaving reviews elsewhere. Far less intrusive than any other form of survey. There's more information about after-call surveys on our website here or do call us on 0800 091 8000 to discuss your need further. Can my agents see what callers are looking at on our website? Yes. This is possible using our ResponseTrack system which can help you to help you ensure your advertising budget isn't being wasted. With this system we use individual numbers served to each web session, to tie the caller into their web session. It is primarily used to establish which Google search terms have been most efficient in driving not just calls but calls that have led to sales, but has the added benefit of allowing us to pop up a view of the interactions the caller has had with your web server. From here the agents can see what the caller has also looked at on your site and so gives them scope to upsell. What do I need to know about daylight savings and BST? In the spring British Summer Time begins and in the UK clocks use BST, resulting in one less hour on the Sunday, and time hops from 1am to 2am instantly. The vast majority of customers will not notice the difference, but some international customers, who do not also change their times on this weekend, will have to consider any time switches they have with us. Calls originating in the UK that are answered in the UK will not notice a difference. Calls originating in the UK but answered abroad, may need to be staffed an hour earlier but the time switch doesn't need to be altered. 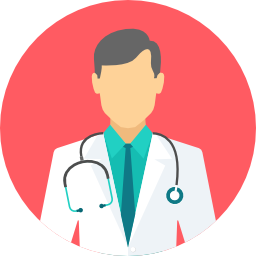 Calls originating abroad and answered in the UK may need to alter time switches to an hour later and staff need to be available an hour later. Calls originating abroad and answered abroad may need to alter the timeswitch to an hour later but there's no difference to the staff. In the autumn British Summer Time ends and in the UK clocks revert to GMT, resulting in an extra hour on the Sunday, and there are two sets of 1am. The people who will be affected are people taking calls abroad who aren't using UK time. For them if UK clocks have moved back and theirs haven't, there will be a time difference on from Sunday morning, whereby we appear to be getting up an hour later. Assuming core opening hours are not changed calls originating in the UK that are answered in the UK will not notice a difference. Calls originating in the UK but answered abroad, only need to be staffed an hour later but the time switch doesn't need to be altered. Calls originating abroad and answered in the UK need to alter timeswitches to an hour earlier and staff need to be available an hour earlier. Calls originating abroad and answered abroad need to alter the timeswitch to an hour earlier but there's no difference to the staff. Can I listen in on a live call? If you are using our AgentCall system, you can. From the Agent dashboard go to the Tools section at the bottom right of the screen and set your landline number in Phone For Monitor, and then hit Save settings. Then if you click on the agent's In Call Status box (generally this is a pink box next to their name) we will set up a call you your landline that is listening in to both sides of that conversation. What is a timeswitch and how can I use it? A timeswitch enables the customer to control call routing between timeswitch bands such as ‘open’, ‘closed’, ‘lunch’, etc. It allows calls to be diverted to voicemail or a closed message during closed hours and automatically re-routes calls during open hours. It can be configured simply by colouring in time-blocks. A timeswitch can be unique to an IVR or can be shared amongst multiple IVRs, thus controlling the routing of multiple IVRs with a single click. This is particularly useful when approaching Bank Holidays or if you have an emergency and wish to play your pre-recorded emergency message. There's more information here about how to change your timeswitch. Can I choose the hold music on my IVR? We have a selection of music on hold (MoH) genres for you to choose from. Alternatively as long as you hold the correct MoH license we will happily upload your chosen file to your IVR. IVR is short for Interactive Voice Response and is a telephony technology that allows for interaction between a touch-tone telephone (sending DTMF tones) and a sophisticated database at Syntec, which allows the customer to enter information when prompted. This interaction assists the customer in selecting from a choice of options and routing their calls to the correct location based on the options they selected with their touch-tone telephone. With our IVR technology you have the ability to play pre-recorded messages, route calls through sequences in order or through agent call groups – trying each agent in a round-robin or skills-based strategy. IVRs are able to play Music on Hold (MoH), place customers in queue, play hold messages (whilst customers are waiting) and also announce estimated hold times, thus greatly improving the customer experience. Our highly qualified and helpful customer support team are available to assist for all issues Monday – Friday 08:30 – 18:00. For all emergency issues affecting your business we have an out of hours team ready to take your call for no additional cost. Can Syntec provide VoIP and SIP trunks? Syntec can handle your call traffic via traditional PSTN or VoIP, and can also provide SIP trunks. Does Syntec offer revenue-share on call traffic? Yes. We offer rebates on non-geographic numbers (NGNs). Check out the telecoms section of our site for more information on the numbering services we offer. No, our software and services are designed to work with your existing hardware and systems. Does Syntec offer outbound diallers? Yes - progressive dialer only, so as to be Ofcom compliant (only making a call when an agent is available, to avoid 'silent calls'). More information about our outbound diallers is available in the Telecoms section of this website.